It's the only thing that can save this hard-core cuticle picker from herself. We all have our vices. Some are sexier than others (think spending an exorbitant amount of money on shoes, chasing partners who may not be right for you, and indulging in one too many drinks on a school night), but my biggest vice happens to be a very unsexy cuticle-picking habit. I’ve been biting my nails for as long as I can remember, and somewhere around high school I decided my nails weren’t enough—I had to wreak havoc on my cuticles too. On a good day my cuticles are ragged and hard. On a bad one they can’t stop bleeding due to splitting and picking. While I’m sure there’s something psychological driving this habit (you can definitely tell the state of my mental health based on the look of my nails—my cuticles were so swollen and bloody my first month of college it's distracting in pictures), the true root of the problem is that my hands are so damn dry. Chalk it up to the weather, dehydration, and the fact that I live with four other people yet I'm the only who does the dishes. This in turn causes my nails to be brittle and easily broken and my cuticles to split and bleed, which I pull and gnaw on to my gross delight. I’ve tried hundreds of cuticle creams, the technique of mindfulness, and terrible-tasting nail polishes, but the only thing that’s remotely curbed my picking is getting manicures, especially acrylics. I need the help of a pro to get my cuticles in shape, and when my nails look pretty, I'm way more motivated to leave them intact. The problem? Getting regular manis is expensive, and I frankly don’t have the time to hit the nail salon every two weeks. 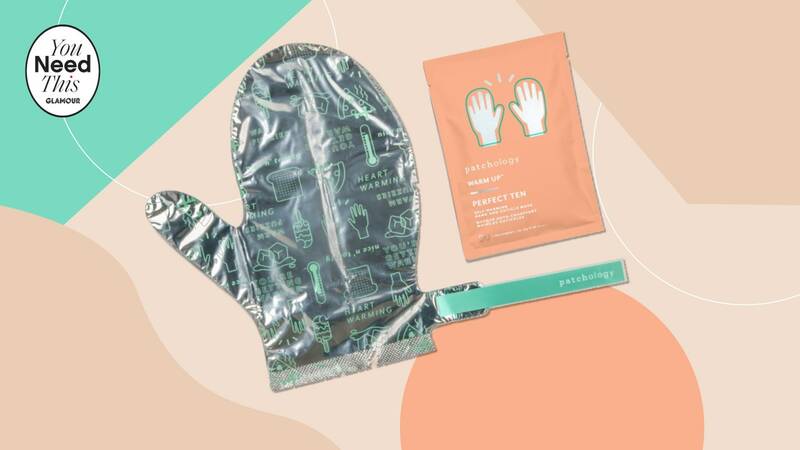 Luckily, I recently discovered the Patchology Perfect Ten Self-Warming Hand and Cuticle Mask, which has given me the closest thing I can get to manicured cuticles at home. The Perfect Ten is a set of foil mittens that contain a liquid mask, a similar concept to Baby Foot's. The mask is a coconut oil base with macadamia oil, shea butter, and rosehip oil to moisturize and soothe dry skin. The mittens are made using the same technology as space blankets, and the foil locks in your body heat to allow the oils to really penetrate your skin. It sounds a little messy, but the mask is pretty easy to use. You slip into the mittens and use the attached stickers to seal them, and then let the heat do its thing for 10 minutes. Queue up something to watch beforehand because your hands will be out of commission while in the gloves. Then just remove the mask and leave the extra oils on your skin to sink in. After one use I found that the mask softened my dry cuticles significantly, which leads to less desire to pick. It also soothes anywhere I had been picking, making my hands look a lot more presentable. Plus, it made the rest of my hands baby soft, which is always a plus. I like to use the mask as the final step of an at-home mani, right before I go to bed, to really let everything sink in. That way I don’t have to rinse off the oils from the mask; I just let my hands soak it up overnight. And while the softness is the most noticeable the very next day, I would say the mask keeps my nails in check for about a week. I won’t be giving up the nail salon completely, but this certainly lets me extend the time between visits. For a picking addict like me, that’s no small feat.